Ten language facts you didn't know about Latvian. 1. Distribution area of Latvian language almost fully corresponds with the borders of the State of Latvia. There are about 1.5 million native speakers of the Latvian language. 1.38 million live in Latvia, but the rest in Russia, USA, Australia, Canada, the United Kingdom, Germany, Sweden, Brazil, Lithuania, Estonia and in small amounts in other countries too. Latvia is the only state in the world where Latvian has official status of the state language. 2. Latvian language belongs to the Baltic language group of the Indo-European language family. Latvian is close/similar to Lithuanian language, because of its ancient affinity roots. 3. There are three dialects in Latvian that can be divided into separate sub-dialects. The Livonian dialect (also called Tāmnieku dialekts) (1) has two varieties - Courland variety and Vidzeme variety. The Middle dialect (2) is divided into Curonian variety, Semigallian variety and Vidzeme variety. The Eastern dialect (3) is divided into Selonian variety and Non-Selonian variety. 4. Standard (also literary and/or formal) Latvian is based on the Middle dialect. 5. The first known text written into Latvian is preserved in a catholic agenda, printed in 1507, in Leipzig. It contains handwritten passages of Lord’s prayers and these passages are known as Gisberts Lord’s Prayers. 6. In 19th century, first novels in Latvian literature are written: “Waves of Life” (Sadzīves Viļņi) by Māteru Juris and “Times of the Land-Surveyors” (Mērnieku laiki) by brothers Kaudzītes (both in 1879). 7. Nowadays more than 200 different newspapers are published into Latvian with total annual circulation of ~ 110 million copies. Also more than 300 magazines are issued, and around 2500 books are printed with total circulation that exceed 67 million copies. 8. Most borrowings / loanwords in Latvian language come from German, Russian and English what can be explained by the past historical events of Latvia mainly. 9. Standard Latvian alphabet consists of 33 letters. 10. Standard QWERTY keyboards are used for writing in Latvian. Diacritic signs are entered by using “default key” (usually " or ~ occasionally). 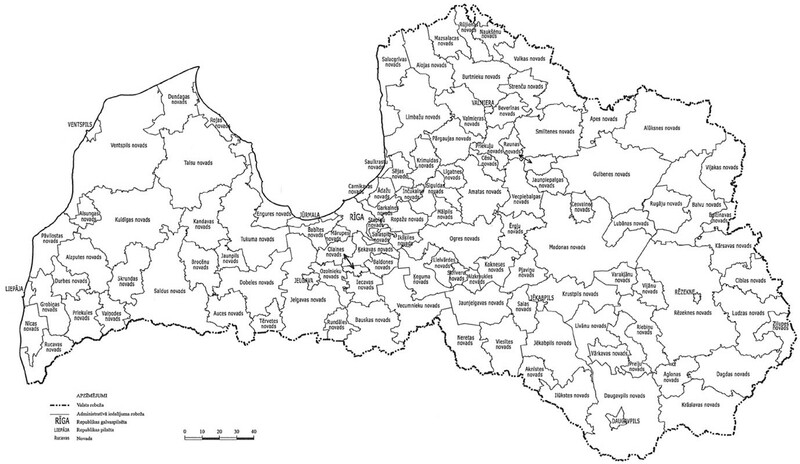 Since the territorial reform of 2009 in accordance with the "Law on Administrative Territories and Populated Areas" Latvia has three types of administrative territories: 1) regions, 2) cities, and 3) municipalities. When creating or eliminating a municipality, and modifying the borders thereof, accordingly to the above mentioned law the following provisions shall be observed. During the meeting (09.09.2011) of Terminology Commission of Latvian Academy of Sciences (LAS) is adopted new official English-Latvian terms.